ODE is pleased to present MOCAREEL™, the new rotary vane pump able to offer high pressure and flow rate performance in various application areas. 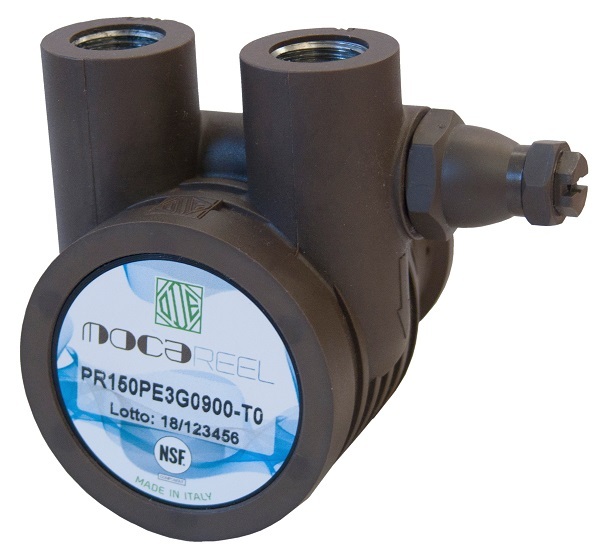 Designed with PPS Technopolymer body and stainless steel connections, MOCAREEL™ can work with fluids up to 70°C and is characterized by a high level of compatibility with food by the NSF 169 certification for water. MOCAREEL™ is supplied with both 3/8 GAS input and output connections, with availability to have 3/8 NPT output connector on request. The design, weight and compact dimensions of the new rotary vane pump make it easy to place and use in the system. MOCAREEL™ is equipped with a bypass valve which allows the drain pressure to be adjusted by means of a regulation screw which, in turn, by acting on a calibrated spring allows the fluid to be re-entered at the inlet of the loop. The pumping chamber and blades are made of graphite, while the shaft is made of steel. Materials that give MOCAREEL™ greater wear resistance and improved food compatibility due to the absence of lubricants. MOCAREEL™ is the ideal solution for pumping fluids in various industrial sectors, including coffee and vending machines, food & beverage, water treatment, reverse osmosis systems, chemical, medical and other industries.